Don’t consider going anywhere else for masks! We had a brilliant few hours making masks with Julia and her husband. They were so good with our kids (9 and 10) – giving them ideas but really letting them build their skills and confidence with quite intricate techniques. The finished articles were truly amazing and will be something the kids treasure forever. We found Sogno after attending one of the ‘free walking tours’ the day before which means you also get a 20% discount on their already excellent value prices. Thank you! Julia was one of the most welcoming people in Venice! Her and her husband Igor own this workshop /shop of entirely artisanal masks and costumes. She gave us quite literally an entire history lesson when we asked about the different Comedia del’Arte masks. It was truly the most memorable hour of our trip to Venice. We bought two beautiful hand crafted paper mâché painted masks. We will treasure them for the rest of our lives. If you have one souvenir to buy in Venice, get it here. 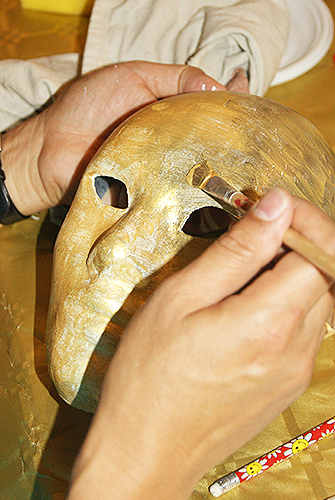 Traditional Comedia del’Arte masks without gold leaf or the venitian carnaval masks go for 45€. It’s worth it. And you’ll be supporting a true savoir-faire! Painting authentic handmade venetian masks in this beautiful little shop with its charming owners was the highlight of our first trip to Italy. Giulia and her husband told us all about the history of each different style of mask and how they hand crafted them. It was fascinating! We had their full attention, the workshop was just our family and the owners. Couldnt ask for better. I was thrilled that my teenage sons also thought this was super fun!